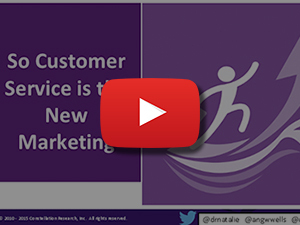 Webinar: Is Social the New Customer Call Center? There are 7.2 billion people on earth and more than 2 billion of them are active on social media, using phones for Tweeting more often than calling. Companies need to adapt their customer service for these social consumers, but social service is more than just resolving issues – it drives brand reputation. In fact, social customer service is such a priority that Twitter recently launched new data and functionality to create improved and transformative customer service solutions for brands. Oracle is one of the select partners with access to this new proprietary data. Join CMSWire with executives from Constellation Research, General Motors and Oracle for a one-hour webinar as they discuss social’s rising role in customer service operations and across the customer experience.